Here’s how you can watch Tuesday night’s Michigan State vs Michigan game from Ann Arbor online. “Beat Michigan” is the mantra on everyone’s minds tonight. If you think the fans are the only ones who take this rivalry seriously, you’re mistaken. Guys like Miles Bridges who grew up as Spartan fans know the importance of Tuesday night’s game and he will thrive in the environment, like always. The first meeting this season between the two teams went in the Spartans’ favor, 70-62. Will this second meeting be more of the same? The Spartans sure hope so. Nick Ward and Zak Irvin were both suffering through the flu during that contest and both should be healthy on Tuesday night. That could make for a more interesting matchup. Will Irvin actually help out his partner in crime, Derrick Walton Jr., or will he make the senior point guard carry the team again? Ward will also look to have an impact in the post again, although he did in the first matchup in just 16 minutes of court time. He finished with 13 points and just two rebounds on 6-for-6 shooting. 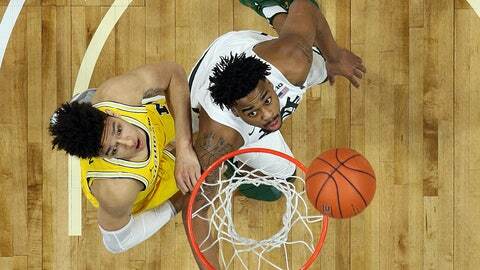 Will the Spartans be able to win their third straight game or will the Wolverines exact revenge? Tuesday night’s game will be much closer than people are expecting.